CAMI Research Inc. (Acton, MA) announces a new board for its CableEye cable and harness testing systems. Populated with solder pads to accept a suite of TE-Connectivity™ Micro-MaTch connectors, the board addresses markets plagued by vibration and fretting corrosion, and requiring “miniaturized connectivity”. Rated to 500Vdc/350Vac, the CB49 may be used on all CableEye models. A leader in development of PC-based Cable & Wire Harness Test Systems for over 20 years, CAMI offers the CableEye suite of Low and High Voltage products complete with accessories including connector boards. The selection of boards is constantly growing and is currently numbering over 60 – most of which are populated with ‘families’ of connectors. These connectors are shown graphically correct with CableEye’s standard dynamic user interface. 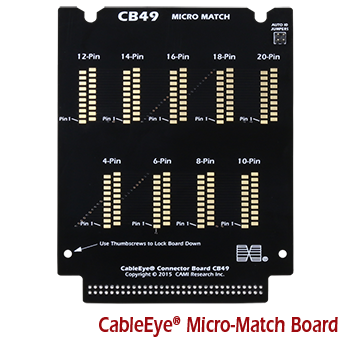 The CB49, sold without connectors, contains nine sets of 20 solder pads accommodating numerous configurations of Micro-MaTch connectors. There are nine preset locations for automatic detection & display of 4, 6, 8, 10, 12, 14, 16, 18, and 20-pin connectors (as denoted by screenprinted labels). Yet, any single set may be fitted with any combination of lower pin count connectors that total to 20 or less (e.g. a 14-pin with a 4-pin). Connectors soldered in non-preset positions will also appear graphically correct once they are mapped with PinMap™ (optional software). Sold as a set of two boards, each Micro-MaTch test board may be paired with other CableEye adapter boards to accommodate any combination of connectors. Customers requiring this board typically have products that endure vibration for which connectors would normally be at risk of fretting corrosion failure e.g. products for Robotics and for Domestic, Commercial & Industrial Vehicular (Radios, Navigation Systems, Dashboard Systems) markets. Connector boards are included in CableEye’s standard, renewable one-year warranty of the tester for which it was purchased. Available immediately, a CB49 set is $195 (Item 779).